Forgiveness and unconditional love are beautiful and godly qualities to possess! In every human relationship, forgiveness helps to heal and restore even the most broken of relationships – often making it stronger and happier! Without forgiveness, your life will be full of bitterness, resentment, and grudges. But what are you supposed to do when you have a person in your life who will not apologize, accept any fault, or change their behavior? Are you supposed to live your life following the principal from Matthew 5:39? Many Christians get caught up in this verse, thinking that it means to always allow others to walk over them and take advantage of them. WRONG! To “turn the other cheek” does not imply that you should consistently place yourself in unhealthy situations. Instead, it is referring to not responding in a similar manner – offensive comments, gossip, theft, and other toxic behavior. The reason this principle is so powerful is because it takes so much strength to respond to hatred with love. However, the Bible also warns us against people who are deceitful, malicious, abusive, immoral, and self-obsessed. You are not supposed to always give people the benefit of the doubt and grant them unconditional acceptance. 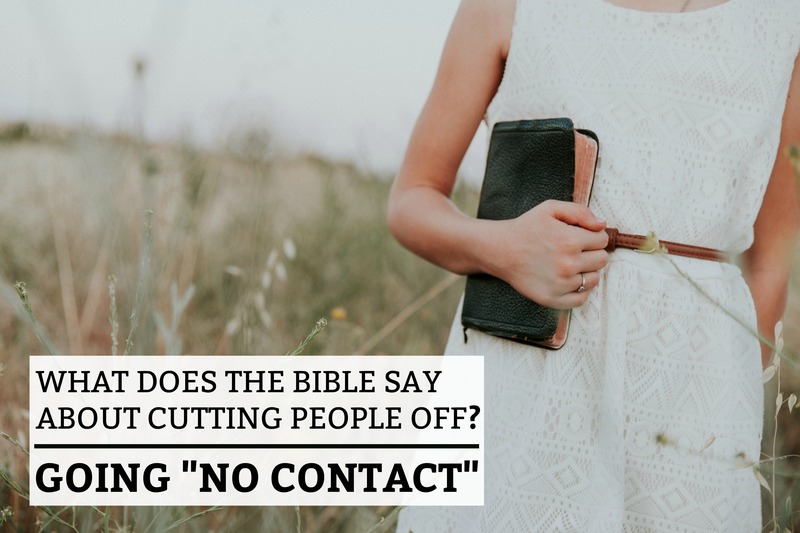 Below are Biblical answers to the most common questions about cutting people off and going no contact. 1.) How can I cut someone out of my life AND forgive them? Forgiveness and “No Contact” are two different concepts. Forgiveness doesn’t mean that there are no consequences for their actions and that you should put yourself back in the position of being hurt again. True forgiveness means that you don’t want to seek revenge on that person. It means that you are going to commit to not hanging onto bitterness against that person. Usually, forgiveness takes a lifetime of effort. It may take a commitment every day to not hold onto hatred for someone. If you continue to put that toxic person in a position where they can continue to hurt you over and over again, read the Bible verses below. 2.) How will I know when to cut someone off? If you have had an argument or a disagreement with someone, it doesn’t mean that you need to cut them out of your life! Differing opinions are a healthy and completely normal part of human interactions. You should be able to have a disagreement with someone, while still understanding that they have the right to their viewpoint. The one thing you need to focus on is TRUST. Relationships are built on mutual trust. If someone has proven themselves to be untrustworthy, don’t try to explain away the reasons for their dishonesty. Have they blatantly lied to you, stolen from you, abused you, been two-faced, threatened you, cheated on you, taken advantage of your relationship, and been a toxic influence in your life? The best thing you can do for yourself and your family is to remove yourself from a place of continued harm. This doesn’t always mean cutting them out of your life immediately! The next step will answer this question. 3.) What steps should I take before going “No Contact”? …under no circumstances is this referring to abuse or criminal acts. The Bible is clear about separating yourselves from violent and evil people. When you talk to someone privately, you can address misunderstandings, and hope that the problem can be solved. This way, you can both avoid gossip and hurt feelings. Christians are instructed on how to handle disputes in Matthew 18. 4.) Are there Bible Verses that talk about toxic people and narcissists? 5.) What good will going “No Contact” do for me? One of the worst misunderstandings about going “No Contact” with toxic people is when people accuse the survivor (the one being hurt) of being bitter and unforgiving. Choosing to distance yourself from someone doesn’t make you unforgiving at all! It simply shows that the relationship has not been restored due to continued abuse or irreconcilable differences. When you have suffered abuse and injustice from someone, you absolutely need to take care of yourself and put an end to their ability to bully you. When someone refuses to take responsibility for their actions and continues to act as if nothing is wrong with their behavior, they cannot be allowed to stay in a place of influence in your life. Choosing to cut someone off will allow you to heal and move on with your life. 6.) How do I actually go “No Contact”? Once you have prayerfully made the decision to cut someone off, you must remain committed to your decision! If you are dealing with a narcissistic person, they will make “No Contact” very difficult for you to keep. They may consistently message you, “love-bomb you, guilt-trip you, spread stories about you, and find other ways to subtly remind you of their presence. This article will give you a step-by-step guide on how to go “No Contact” with a toxic person. Remember, forgiveness doesn’t mean restoring them back into your life. One common tactic of toxic people is to suddenly be willing to apologize and change their ways. The only thing that can prove genuine change is time and a consistent change of behavior. “No Contact” should NEVER be broken simply because someone wants to talk to you. Don’t make a commitment that you aren’t willing to keep. Once you remove someone from your life, you absolutely need to commit to it 100%! 7.) How Should I move forward after cutting someone off? Once you have removed someone from your life, try to move forward and focus on healing. NEVER take revenge into your own hands. This includes talking behind their backs and spreading stories about them. If someone has treated you in an abusive or toxic manner, it is not your responsibility or right to “get even” with them. God made it very clear that He will take care of the situation. You need to focus your effort on finding healing for yourself. Often, the first step in this process is pursuing forgiveness for the hurt that you were caused. Many people have stood up in a courtroom and publicly told a criminal that they forgive them for their horrific crime against themselves or a family member. If you were to ask them why they did this, they would always mention that it was an important step towards healing from the tragedy. The same principle applies when cutting someone off. The Bible talks about the importance of forgiveness. Actually, it commands us to forgive. Why? Because without forgiveness, there is no healing. Holding onto bitterness and hate is a sin. It doesn’t mean that you have to forget what happened to you. However, learning to move beyond the pain and focus on all the good things that God has placed in your life is a wonderful gift! Going “No Contact” and removing someone from your life who insists on continuing in their destructive behavior is a biblical step towards healing. Knowledgable, clear you are both, congratulations!!!! I wish to read your article many years ago! I am a mother of 2 adult daughters.. my eldest gave me grieving time for 41 years who is now is 45! It took me so long to accept she is narcissistic, and don’t blame myself because may be I did do something wrong by her! When I witnessed my youngest daughter turned out lovely, kind, caring, professional and also Christian , than I finally realised “it is not my mothering and my fault, but something else (mystery)…. Thank you soo much about enlightening the people. Very helpful answers to questions our family has been dealing with for over a year. The people we’re dealing with are my husband’s and my own son and his wife. As Christians, we had already chosen “ no contact” but were feeling so guilty. Thank you. Hello Patty! I’m so glad you found some value in this article. I’m sorry you have to go through this difficult situation. Choosing “No Contact” often leaves you feeling guilty, but it is sometimes the right choice. Wishing you all the best – Caroline. Thank you. This is a confirmation of my decision today to cut off from toxic people 🙂 God bless! This has brought me so much comfort! After struggling for 13 long years off and on to make a relationship work with a toxic family member I decided today to let go completely. I have felt guilty all day thinking I wasn’t in God’s will but I can see that I am not doing anything that’s not biblical. Thank you for the verses to back it all up. I can sleep in peace tonight knowing I’m making the right decision.